I played hookie. I admit it, to the chagrin of my wife. She is always kind enough to give me "the look" when I consider skipping out on my classes. All I can say is, I'm so glad I did! I only wish I could make it out one more time, but unfortunately midterms have me tied down. Blah. Well here are the goods from what appears to be my last trip to Henry's lake in its liquid form this year. Looking at this pic just reminded me... when we first arrived at this spot we had a crusty old codger try and convince us that the fishing that day was an "exercise in futility." Those were his exact words. He was clearly trying to discourage us from fishing this area, and at this particular time. When I tried to be kind and chat a bit about the change in water temperature, he talked in a condescending way and acted as if I had no idea. He took off just before the show started though. I sure would have loved to have seen his face when we started sticking fish after fish. Josh's net was just a bit too small for Henrys. Those fish didn't like staying in it too much. My wife is so good to me, despite her "look" she is always supportive of my love for fishing, and I can tell that she is glad that I enjoy it so much, even when she doesn't think it's the best idea to skip a class. Love you honey! Great video. There is definitely a trend going on in the world of fly fishing. Many go out, not only with the intent to catch a fantastic fish or take in the beautiful scenery, but now many aim to catch it on film. It's a trend that I cannot deny having a desire to be a part of. I don't care for the following that many are looking for. The appeal for me is in reliving the experience and putting a kind of frame on what is already a beautiful picture. It takes some talent and a whole lot of time in putting together even a short video. I stumbled upon this particular video on midcurrent.com It has a feel good, lots of fish, beautiful surroundings kind of resonance that conveys a small bit of the essence of fly fishing. I can't get enough of those rod-bending hook sets. Fly Fishing Eastern Sierra Nevadas from Chris Marino on Vimeo. I had a good friend in town from California, so we decided to take a morning during his stay here and hit up Henry's lake. Nothing too amazing to report. Fished scuds primarily. Started around the state boat ramp, until people showed up, then we went in search of more secluded water. We got into enough fish to be satisfied, but I'm sure we would have done much better if the weather were a bit more blustery. It made for a picturesque day though! I was also able to meet up with a new friend and fish the Teton a bit between classes. 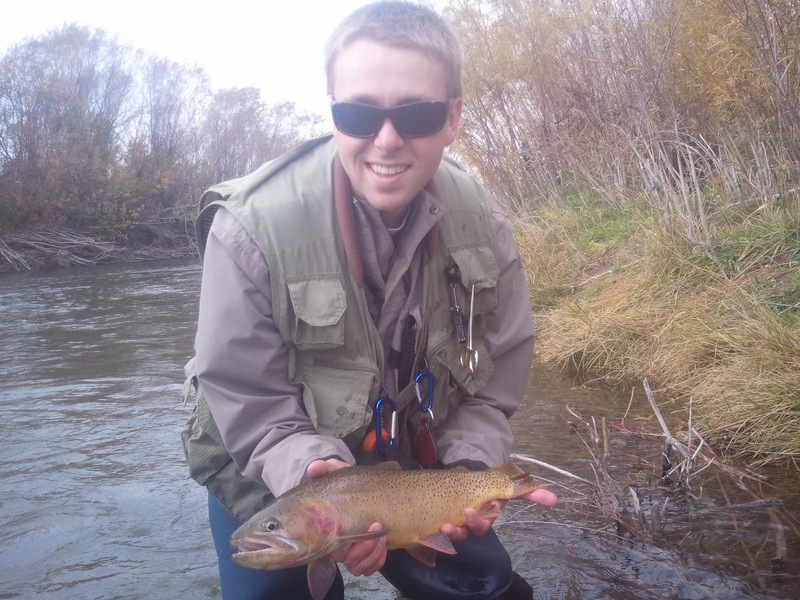 He was able to get into some late October dry fly action, which was great to watch. I was also able to get some takes on my new minnow pattern, though I'm sure all the leaves that were falling in the water from the wind might have lessened its effectiveness. It was great to meet up with Josh and get into a few fish. There's a fine line between neglecting ones responsibilities and keeping in the know with the fish. Since starting school up again, my time chasing scales has been a bit more limited. I have fortunately been able to find time, in between my classes, to explore some areas of the Teton River. Five minutes from campus and I've been pleasantly surprised! One of the exciting things to note, beside the fact that I can get into some good sized fish with only an hour to fish, is that almost all the fish I've been catching have been taken on a little sparkle minnow pattern I just made up. It's always fun to tie your own flies, and even cooler when they catch fish. These last few pictures were some of the bigger fish taken. All in all, this hidden gem of a fishery has been a godsend in a very stressful school year. A perfect therapy.